Most children's television is awful, as any parent of a young child can tell you. For those without children, these shows feature some sort of brightly colored talking dog or cat, or maybe even both, providing your child 18 minutes of ostensibly educational viewing while you take advantage of the free time allowed by this on-demand animated nanny. But the medium nevertheless allows for the occasional moment of brilliance, and that's what I found when I powered up Netflix at 6 am through sleep-starved eyes last week and clicked on Beat Bugs for my 3-year-old. The opening sequence treated me to "All You Need is Love," which, in addition to providing a lesson in human decency even my kid could understand, is a freaking Beatles song. I soon realized that every episode of this kids' program is based on the lyrics and themes of a single Beatles track, eventually including the song itself. This is genius and also makes complete sense, given that the Beatles' whimsical lyrics can easily lend themselves to a children's show. Beat Bugs creator Josh Wakely, who said that he'd always wanted to bring the Beatles' music to life through television, somehow — given how tightly held the Beatles' catalogue is controlled — pulled it off with aplomb. "What is it to go into a strawberry field forever? What would it be like to actually be inside that yellow submarine?" Wakely told the New York Times on the eve of Beat Bugs' release last week. The show itself is about bugs (and a slug), all with their own distinct personality traits, who live in a suburban backyard. You'd be correct in saying that summary sounds tragically similar to myriad other kids' shows. But when, for example, the extreme-sports-loving Jay gets trapped in a glass jar that's slowly filling with rainwater, he shouts for help... and of course, we hear him sing "Help." Wakely was able to bring in star power to voice many of the songs, including Eddie Vedder on an even wackier "Magical Mystery Tour," as well as cuts from Pink and Regina Spektor, among others. 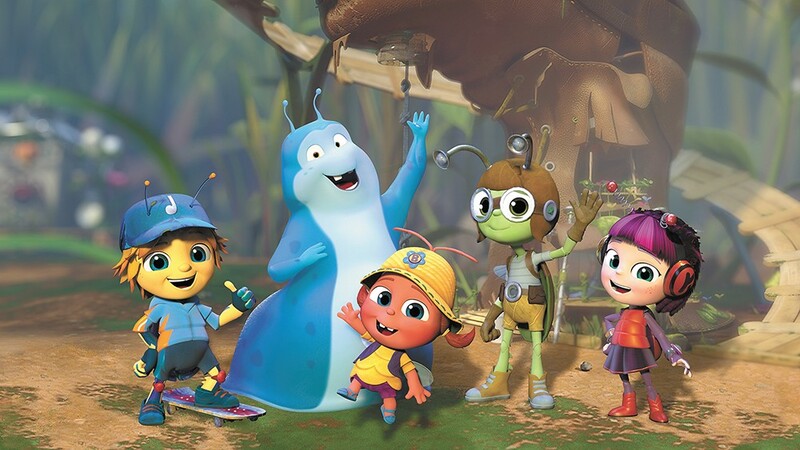 For those of us who believe that the Beatles' catalogue needs to be handed down to the next generations, Beat Bugs is an oddly important piece of pop culture. But those who just like to watch brightly colored bugs while lying around in their jammies will also love it.